Last year when I attended the garden bloggers Spring Fling in Chicago, I had a severe case of allium envy by the end of the weekend. 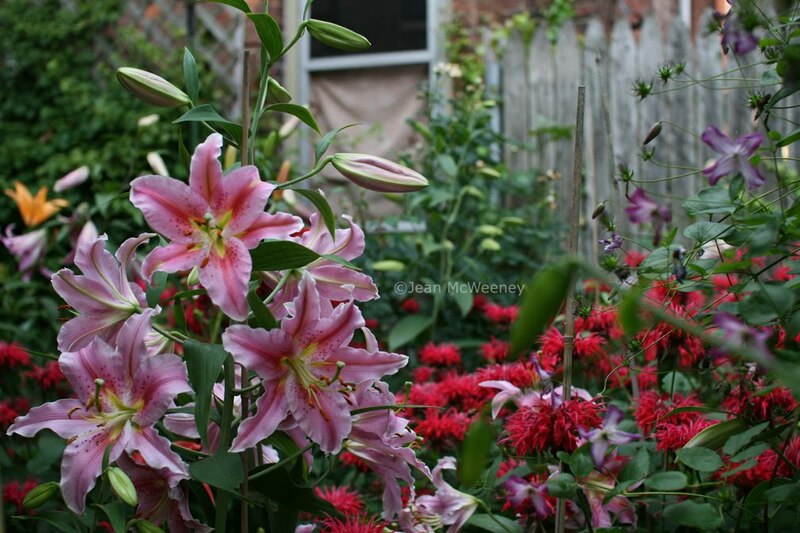 This year's garden bloggers meet-up in Buffalo gave me a bad case of lily lust. These little bitty gardens were mighty big on fragrance. This backyard on North Pearl Street bowled me over as the fragrance was so intense. 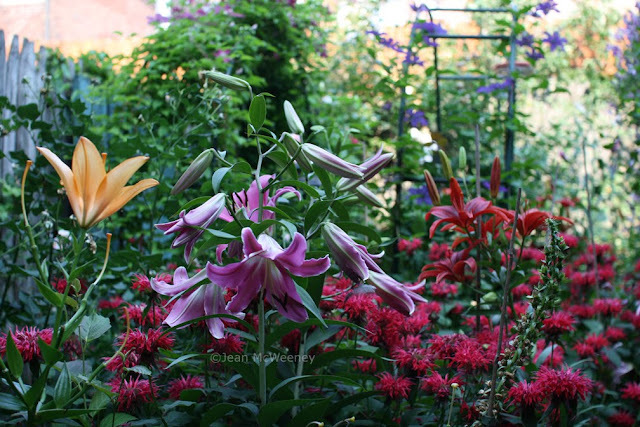 Here's more lilies from the same garden. The monarda on the right, clearly the biggest and healthiest I've ever seen, were like this in EVERY yard. What's the secret? I think I could eat this one. I really loved these lilies from the gardens of Kathy Guest Shadrack and Mike Shadrack. The blazing sun doesn't do them justice. Maybe they're common to folks in the north, but not to me. I hope you can see the little feather hanging on this lily. This lily was as tall as I am. Can you imagine being surrounded by such beauty and fragrance? 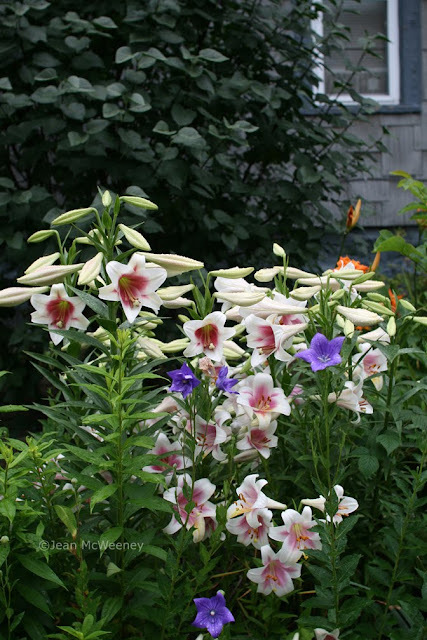 One of my dreams is to have a cottage garden in front of my house and grow a few lilies. Is that a pipe dream? 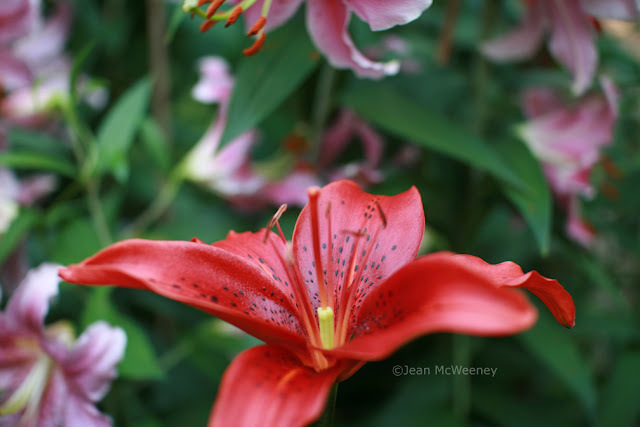 I'm sure there's a few good southern lilies out there, preferably heirloom ones. I plan to do some research when I get closer to that dream. More Buffa10 posts to come! Were the Lilies not insane during Buffa10?! Seriously, were they feeding them elephant manure or something? LOL @ Chris!!! You need to get you some Orienpet lilies. The fragrance is to die for and yes, they're really that tall, as you saw. These days when I walk to and through the gardens, I can be seen coming to a full stop and staying there to drink in the fragrance each time I pass the fragrant ones. And it's even better in the evening. If you watch just as dusk falls, you might get to see a Sphinx moth come in to drink in the nectar. What a treat! I think those folks in Buffalo have been holding out on the rest of us, making us go there to see it all for ourselves. What's up with that? Oh well, we suffered through it, didn't we? LOLOL. So wonderful to see you, Jean. I hope we'll have the opportunity to see each other again. I enjoyed being with you! Lily lust? Or yes, "big time". I need some more lilies, clearly. Lots more. Someone in Buffalo ought to get a commission from the bulb companies because of all the lilies some of us will be buying because of them! I finally "get" lilies. Pictures in magazines never moved me. But seeing--and more important, smelling--them in Buffalo won me over. The lilies there were really outstanding. Love the feather shot! The only problem in this area is the need to control the lily beetle - worth it though! I'm loving all these photos from Buffalo. The lilies are spectacular. That last photo should be entered in a contest! I was also blown away by the lilies. I think that dark one is 'Landini.' It was hard to photograph them in the blazing full sun. Instead of stopping to smell the roses, I stopped to smell the lilies. The best thing about lilies is that they don't take up much room. I need some of those huge orienpets too. 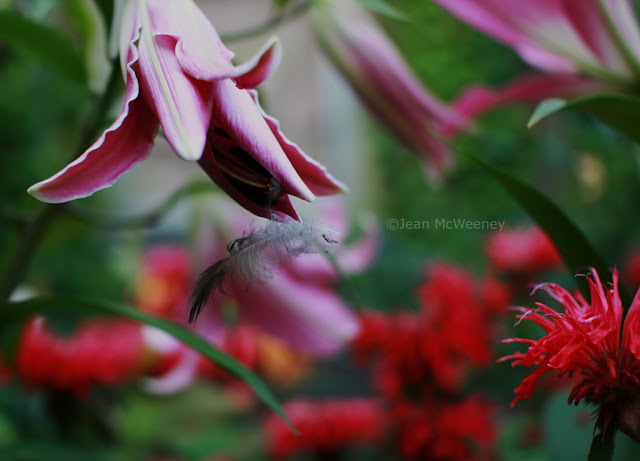 Jean, I think the species lilies are the hardiest. There is an auratum, if you can find it, that is lovely and smells great. And yeah the orienpets. But I do think lilies require a cold period. Oh, I would have been smitten with lily lust, too, Jean! These are beautiful. And I have noticed the monarda on so many Buffalo posts; if you ever find out their secret, I hope you'll share it with us. Since I didn't get to attend this year, I'm enjoying the weekend vicariously through everyone's posts. Thanks for sharing not only these photos, but the photos of the bloggers on Tuesday's post--wow, 70? Maybe next year will see 100! So happy to meet you and chat with you this weekend. What beautiful shots. I do love that first one. 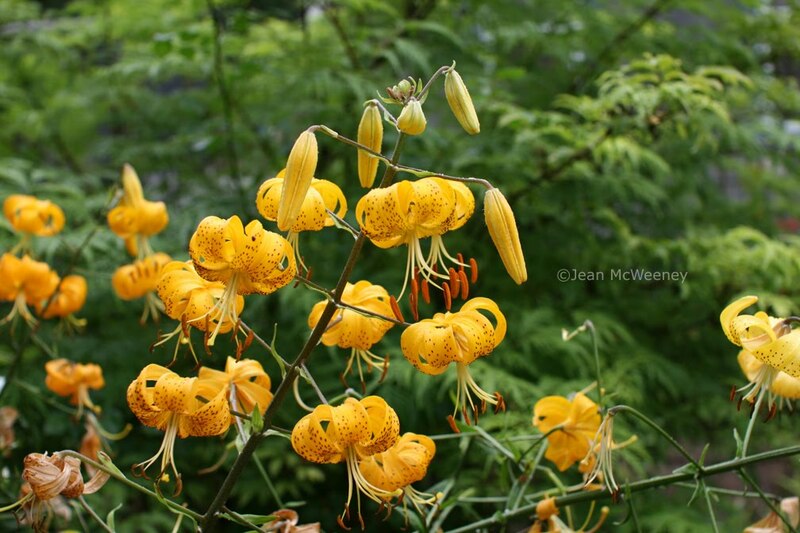 Absolutely beautiful pictures Jean! Thanks so much for sharing your trip to Buffalo. I so wanted to go, but was not able to this year. 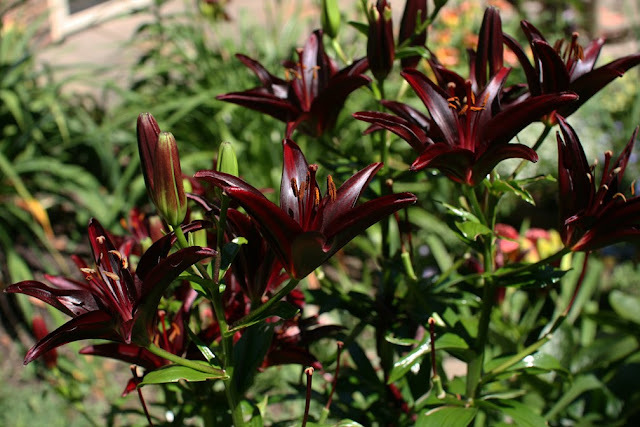 The lilies are stunning in every way, I especially like the deep reds, I've never seen any like those. Looking forward to more posts about Buffalo. I live close to Buffalo, but can't grow lilies like this. Between the groundhogs and the deer, mine always look suspiciously like gnawed-off sticks. Jean, the lily in the next to last picture is Triumphator. We CAN grow that one! I've bought it at Enchanted Forest before. If you can't find it locally, let me know & I'll grab one for you next spring. They were fantastic! And so are your images. Wonderful shots!!! The photo would not have been as good had you removed the feather. Luv it! I planted various Asiatic Lilies late last summer and after seeing them bloom this summer, I'm crazy in love with them and will plant more. The flowers almost don't look real. Jean, I mentioned your blog in my latest post. Just wanted you to know. I have a few lilies, but they are pastel. I've been seeing different colored ones on some blogs, and have some good places for those darker colored ones. I keep forgetting to look up tango lilies. Some of these remind me of some I've seen on a blog. Be sure to check out Old House Gardens which has heirloom lilies and always has info on plants for north and south. I'm only growing a few but they are easy and don't take up much real estate.